I love snapping pictures of Noah doing cute, typical things. 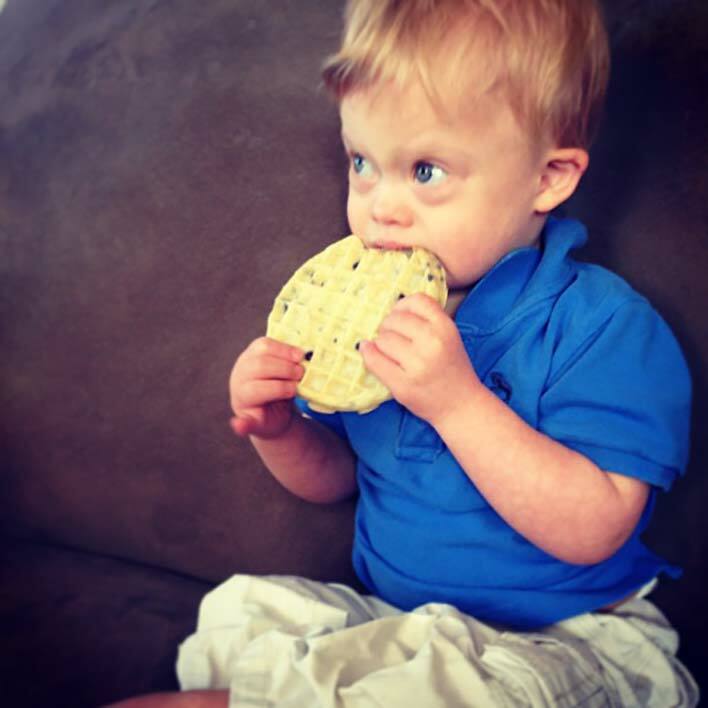 When I first learned that Noah was born with Down syndrome I worried about how different Noah would be than typical kids, and that scared me. 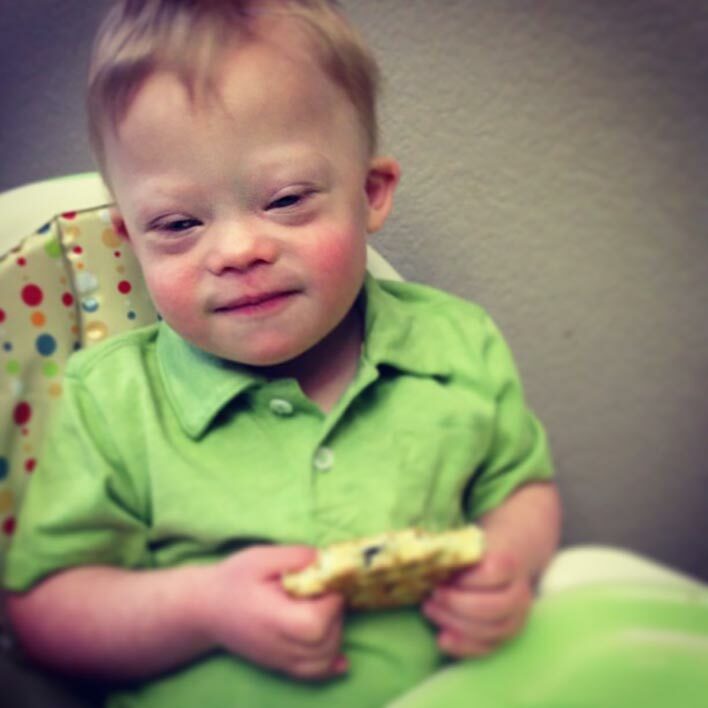 It turns out that raising a child with Down syndrome is much more normal than I would have ever imagined. Like over 150 million other people, I’ve been sharing images almost daily to our Instagram account. I’ve been doing this for a few years now in my attempt to show the world than children with Down syndrome are much more “like” other than children than “unlike” them. So I thought I’d take a look through my Instagram archives to see how many pictures I’ve snapped and shared of Noah eating one of his favorite foods, Eggo Waffles. It turns out there were six, and here they are. 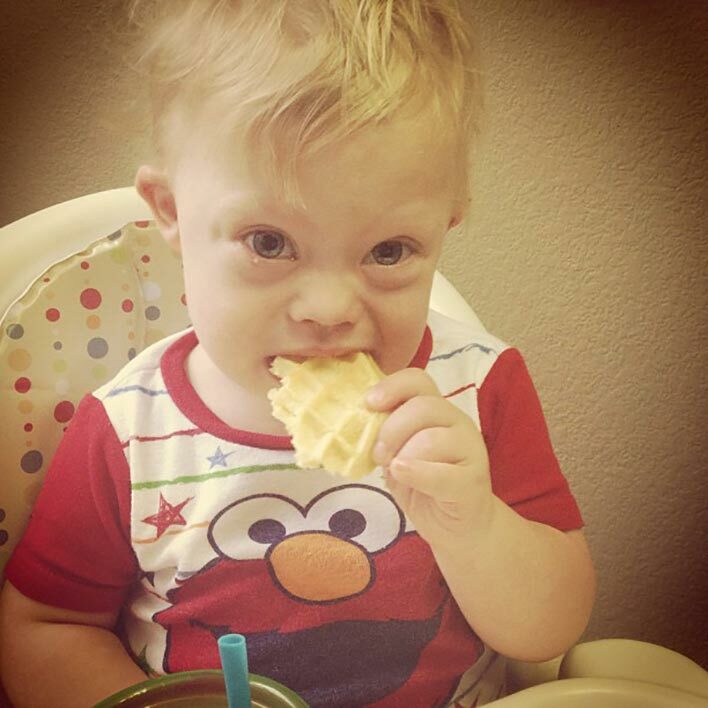 I could watch this kid eat waffles all day! What’s your kid’s favorite food to eat? Leave a comment below and let us know. Bonus points for leaving a picture in the comments as well! I enjoy receiving your e-mails. My Joe – unbelievable but he is now 22. Yeah he started out liking stuff like hot dogs, apple sauce, waffles but he now has graduated to adult food and he LOVES to eat Alaskan King Salmon and filet mignon. Can you believe that? He has the healthiest appetite. He eats lots of salads, kiwi, veggies, BUT he still loves his pizza even though we are supposed to be dairy and gluten free. It is hard to find an acceptable dairy free pizza! We are on a soy-free, gluten-free and dairy-free diet. I make mini pizzas out of thick homemade corn tortillas (following the directions on the maseca bag) and use Daiya brand dairy-free/soy-free cheese from whole foods. Not sure where you live but Z Pizza has great dairy, soy and wheat-free pizzas. They are in several major cities. I’m just getting my sea legs, in this whole parent of a baby with T21 thing, but it’s so normal it suprises me sometimes. My little guy is only about a year younger then Noah. 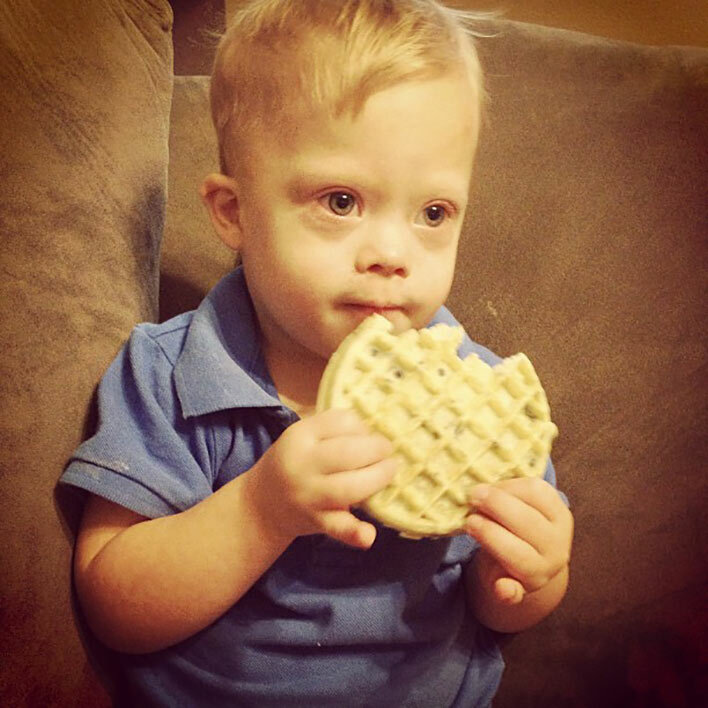 Your blog has been a great resource for me as a parent of a special needs kiddo. 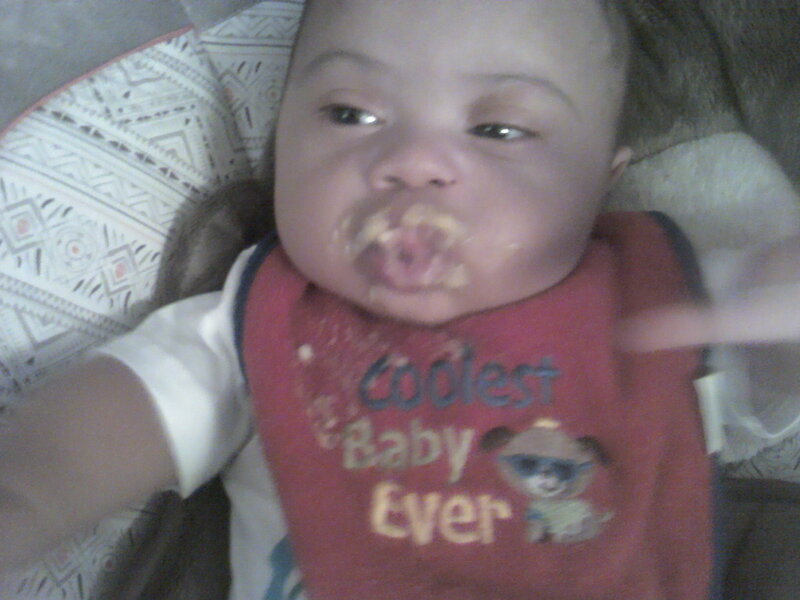 My little guy has an underdeveloped brain likely caused by genetics resulting in developmental delays. 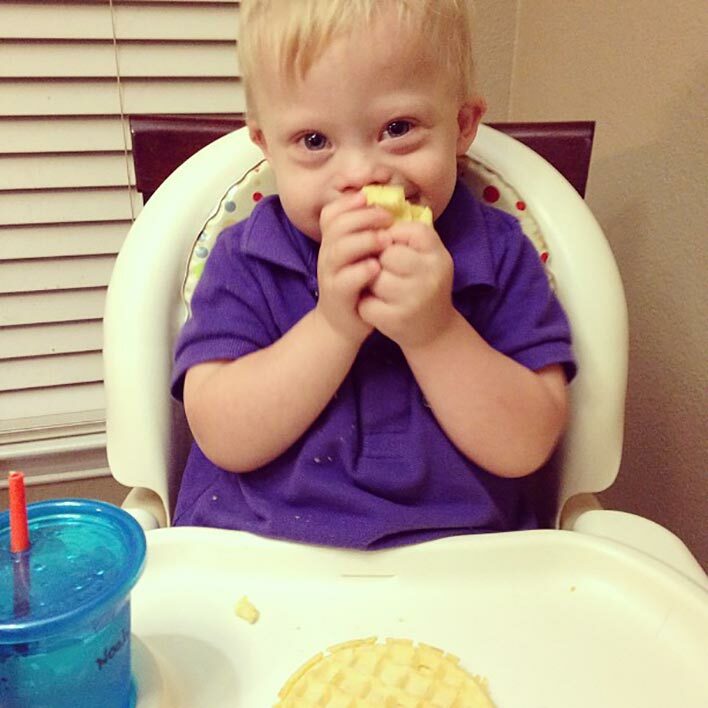 He likes waffles too but his truely favorite food is O’s. I can put a handful of them in front of him anytime and he’ll gobble them up. Just want to thank you for the reassuring comments and photos for this grandma. We are expecting a DS baby in November. Noah is wonderful and so are his mommy and daddy! Kathy, thanks for your comment! How are you guys doing with everything? What part of the world do you live in? Rick! I can SO see our NoaH-boy in commercials with those wonderful baby-blues shining. Who could resist?! have you had any problems with Noah’s eating habits? I have a almost 5 year old grand daughter with down syndrome, and my daughter is having a hard time getting her to eat. At breakfast the only thing, she will eat is yogurt and some fruit, and she is still on junior baby food. Her weight is good and she does like the baby puffs etc, fries and mashed potatoes with gravy, but that is it. When she was younger she would eat scrambled eggs, and porridge, but now has stopped eating them altogether. Can you suggest anything. Hmm… We have only had the typical feeding / eating issues that all two years old have, which are all behavioral. Has your daughter brought your granddaughter to a speech / feeding therapist? They could posable be a big help. What does her pediatrician say about it? 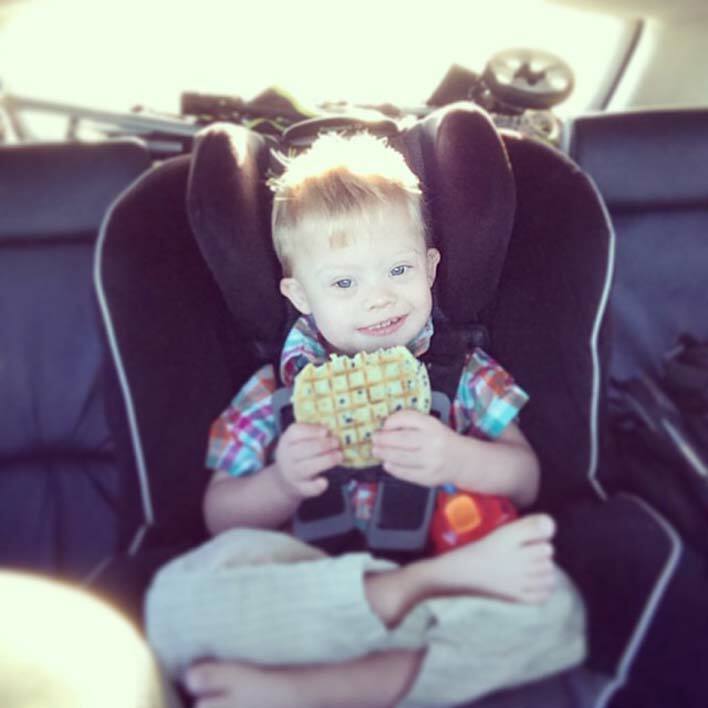 I wanted to thank you for this post of Noah and the Waffles. I read the post and thought “Holy socks, Mr. Rick gets it!” Four years ago, when I was 16, it was a transforming week of God’s grace, bowls of Froot-Loops, and a rambunctious little girl with cerebral palsy that pulled the barnacles off my brain and proved to me this much: kids are kids. Jesus has finished the work on behalf of every person, also people with exceptionalities. How many more needless limitations do I put on God and others when I pretend otherwise? Thank you for doing your best as a husband, dad, and child of God. There is more to be had, so onward and upward! The very best is yet to be.